Find the right expert witness from the start. Don’t waste valuable time digging through online directories to find an expert that might work. Trust your expert witness search to a partner like Saponaro, Inc. – one who screens and identifies the best expert for your needs, and guarantees a credible expert. This takes part of the workload off your hands and allows you to focus on what you do best: litigating a successful case. Explain the expert’s qualifications in a way your audience understands. If you don’t adequately explain your testifying experts’ professional background and experience, you’re setting yourself up for failure. Direct examination is your time to humanize your expert witness while proving their knowledge, experience, and credibility. Moving forward, the jury will trust that your testifying experts know what they are talking about. Stay focused on the expert’s area of specific knowledge, not a broad range of questions. If you venture outside your expert’s area of focus, you risk showcasing your expert as anything but. Your expert’s testimony needs to be reliable and relevant. If questions lead the expert to provide opinions outside their area of expertise, cross examination will try to expose your expert’s lack of knowledge on the subject. Give your testifying expert demonstrative evidence. Items and artifacts the jury can see or hear can add major value to your expert’s testimony. For example, is there a piece of equipment your expert witness uses on a regular basis that you can show the jury to help clarify a complex technique or job duty related to the case? 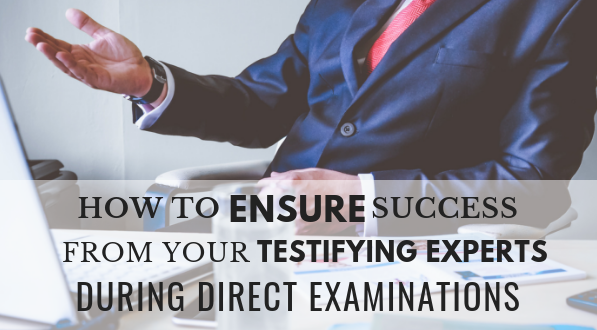 Oral testimony will encompass most of your testifying expert’s direct examination, but demonstrative evidence helps illustrate important points and keep the jury’s attention. Summarize your expert’s key points. Repetition is key for remembering important information. If you want your jury to remember certain details, or points, your testifying experts make, repeat it. Ask questions during direct examination that requires your expert to emphasize and repeat certain data points. Concluding your expert’s direct examination with a summary not only reinforces what the expert said, but helps the jury tie it all together. Testifying experts add major value to a case, especially when direct examinations are successful. Do your due diligence prior to questioning your testifying expert by knowing what you need to accomplish – the above steps ¬– going in. Let us take the work of identifying an expert off your hands. We have thousands of experts standing by to assist you with your case. Find one today.